The US director of national intelligence has said he "never felt pressured" to influence the inquiry into Russia's political meddling. Dan Coats also told a Senate panel he did not think it was "appropriate" to discuss his conversations with the president at a public hearing. His comments follow a report that President Donald Trump asked him to derail the Russia investigation. The National Security Agency chief also declined to comment on the matter. Admiral Mike Rogers told a Senate intelligence committee on Wednesday he has never "been directed to do anything illegal, immoral, unethical or inappropriate" as NSA director. Mr Coats echoed Mr Rogers' statements as senators pressed the pair on their interactions with the president. "I'm willing to come before the committee and tell you what I know and don't know," he said. 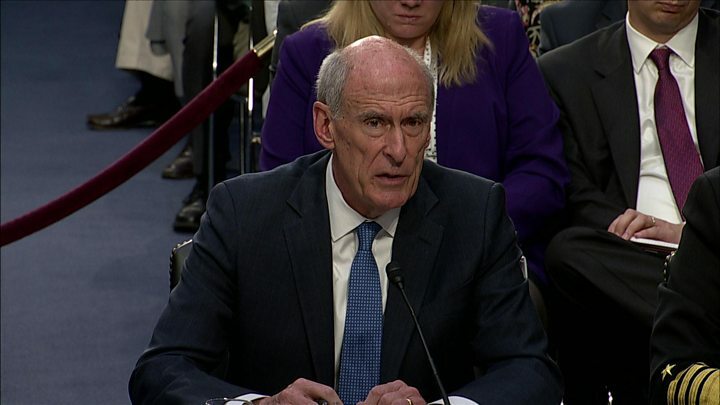 "What I'm not willing to do is share information I think ought to be protected in an opening hearing," Mr Coats told the panel. He is later appearing in a closed session before the committee on Wednesday afternoon. This Senate testimony by intelligence community heads was billed as the undercard to James Comey's appearance on Capitol Hill on Thursday, but it turned out to be a big letdown. Top intelligence officials in the US government have taken a bunker mentality when it comes to the investigation into Russian meddling in the US election, refusing to share details of presidential conversations in open Senate testimony. Robert Mueller's special counsel investigation, it seems, has the spooks spooked. That may come as a relief to a White House that has been buffeted by a seemingly never-ending stream of controversial revelations, from allegations that the president attempted to influence the investigation into former National Security Advisor Michael Flynn to reports of internal divisions within the administration. The president and his aides shouldn't breathe easy, however. Although today's testimony was largely a dud, Mr Comey - no longer a government employee, thanks to Mr Trump - will have more leeway to discuss his interactions with the president if he so chooses. His former colleagues my have seen discretion as the better part of valour, but the former director isn't known for backing down from a fight. Mr Coats's testimony comes a day after the Washington Post reported that he told associates Mr Trump had tried to persuade the FBI to back off their investigation into his former national security adviser, Michael Flynn, and his ties to the Kremlin. The two intelligence chiefs joined acting FBI Director Andrew McCabe and Deputy Attorney General Rod Rosenstein to testify before the panel on Wednesday. The lack of answers appeared to frustrate both Democratic and Republican senators, who repeatedly pressed the intelligence officials on the Russia inquiry. Republican Senator Richard Burr, who chairs the committee, ended the hearing by appearing to rebuke the intelligence officials for their testimony. "At no time should you be in a position where you come to Congress without an answer," he said. The following day will see the much-anticipated testimony of Mr Comey, who was leading one of the Russia investigations before Mr Trump fired him. The conversation occurred the day after the president asked Mr Comey to end the investigation into Mr Flynn during a private dinner, according to the New York Times. Mr Comey believed the attorney general should protect the FBI from White House influence, officials told the paper.